to do, and corresponds with effective use of the harmony within yourself. forward with a pole swing to start a turn to the right, and stays there throughout the turn, though the pole is tipped back. 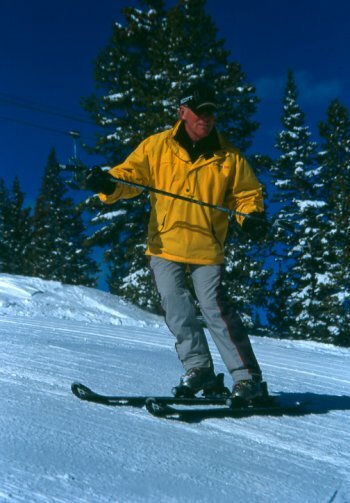 The right elbow bends, and the knee mimics the bend, conforming to the hill, as the ski rolls onto an edge inside the arc of the turn. The turn-side™ leg shortens and the outside leg lengthens. In short, quick turns it’s often easy to see the hands tilting toward the slope of the new plane, before the feet do. 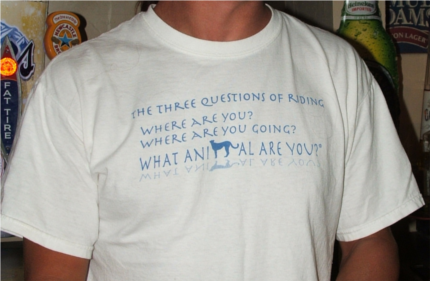 The right hand of the skier in the photo, is higher than his left, as he goes around a gate. His feet will follow him into the a new right turn. Whether cross blocking a gate in a race, making an easy pole swing, or just raising one arm higher than the other, the ski will tip toward the higher hand. The hands and feet will become parallel with the hill. 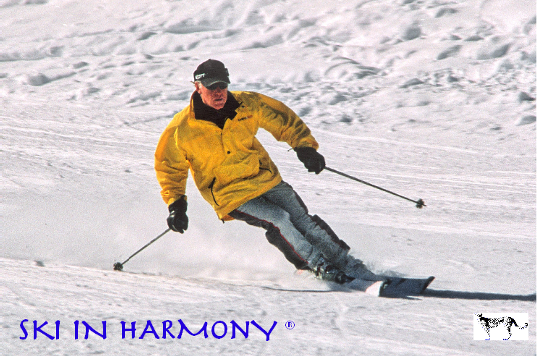 Your body moves into harmony with the mountain. If everything has gone reasonably well, your feet do because you’re standing on it, and your upper body does because the pole swing gave an uphill and forward relationship to the turn-side™ hand, which you maintain. 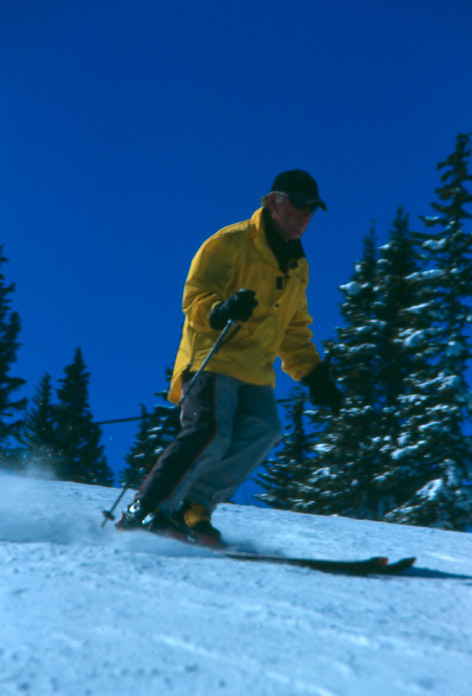 The combination of moving the hands and feet in harmony with the slope creates a powerful stance over the edge of the skis, and flow into the turn. This unifies the benefits of the har mony within yourself and the equipment. See for yourself. Turn to a stop in freeze frame fashion. See whether or not your hands and feet finish in the same slope as the hill, and slant of the skis tips. Both skis tip onto edge to support you.